Wooden box with hinges and brooch of various sizes to choose from. Available in 8 measures. If you do not find the measure you need, we can manufacture it with a minimum order. Check prices by email. If you want to add an engraving click the "Add engraving to this product" button and follow the instructions.. Boxes of pine wood with hinge and classic clasp. Available in 5 measures. If you do not find the measure you need, we can manufacture it with a minimum order.Check prices by email. If you want to add an engraving click the "Add engraving to this product" button and follow the instructions.. Boxes with book shape, smooth with hinges and brooch. Very original box for a special gift. Available in 3 sizes..Internal measure - A6 = 15.5x11x4.5 cm. - A5 = 21.5x15.5x5.5 cm. 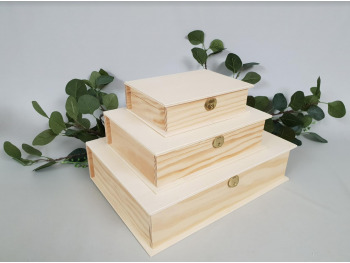 - A4 = 30.5x21.5x7 cm..If you want to add an engraving click the "Add engraving to this product" button and follow the instructions..
Small trunks different sizes made of natural pine wood with hinges and clasp. A web discount is applied for orders from 150 uds./ measure. Available in 4 different sizes to choose from. Solid pine wood chest with hinges and clasp and the curved striped lid, to give it a more vintage look..Measure - Inside of the box 26x18,5x12,5 cm. . Box in poplar wood, square shape with hinge and brooch..Measure - Inside of the box 15,5x15,5x11,5 cm..If you want to add an engraving click the "Add engraving to this product" button and follow the instructions.. Wooden box made of poplar with hinges and brooch..Measure - Inside of the box 26x22x15 cm.. If you want to add an engraving click the "Add engraving to this product" button and follow the instructions.. Box made of pine wood with hinge and clasp. Very elegant box to deliver gifts..Measure - Interior of the box 31x20x10 cm. 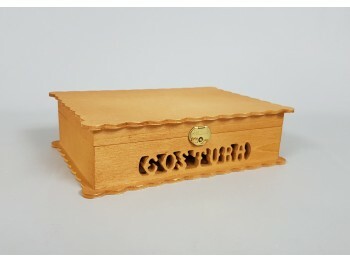 If you want to add an engraving click the "Add engraving to this product" button and follow the instructions. .
Long poplar box with hinge and brooch. It can be used for the candles of baptism..Measure - Interior of the box 34.5x6.5x6 cm..If you want to add an engraving click the "Add engraving to this product" button and follow the instructions..
Poplar wood box with hinge and two clasps, opening the lid with hinges at 90º..Measure - Interior of the box 48x18x4 cm.. If you want to add an engraving click the "Add engraving to this product" button and follow the instructions..
Poplar wood box with 36 interior divisions. It has two hinges and a clasp and the interior is removable. Perfect for collectors!.Measurements - Interior of the box 38x32x4.5 cm. - Gaps 6x5x4.5 cm..If you want to add an engraving click the "Add engraving to this product" button and follow the instructions.. Wooden box hinge and clasp with removable inner trays with a capacity of up to 16 watches. A tray is fixed at the bottom of the box and the other 3 are removable as you can see in the photos. Measure - Outside of the box 27x225x11 cm. - Inside of the box 25x20x10 cm. - Hollow for each watch 24x4,5 cm.. Box type case, made of pine wood with hinges and suitcase type clasp. Carry a handle to be able to transport it more easily. Inside it includes a painter palette to mix colors. Measure - Interior of the box 35x25x5 cm..
Octagonal wooden box with hinge and clasp, super elegant for any gift you want to make..Measure - Inside of the box 22x22x18 cm..If you want to add an engraving click the "Add engraving to this product" button and follow the instructions. .
Octagonal wooden suitcase box with hinges, clasp and wooden handle..Measure - Interior of the box 30x17x17 cm..If you want to add an engraving click the "Add engraving to this product" button and follow the instructions..
Dyed box for sewing with the lid and bottom in the shape of waves and the word seam trimmed on the front of the box. Measure - Inside of the box 19x12,5x5,5 cm.